This weekend, GraceConnect wants to provide a complete photo album of Easter images from the Grace Brethren family of churches. We invite you to shoot photos on your smart phone using the Instagram app and mark them with the hashtag #eastergraceconnect. They will automatically appear in the album at https://graceconnect.us/easter2013. Be sure to include a hashtag with your church’s name and a brief description of what is happening in the photo. Tweets on Twitter that use the #eastergraceconnect hashtag will also appear on this page. Instagram is a free app available on most smart phones, but you will need to set up your own account, if you don’t have one. 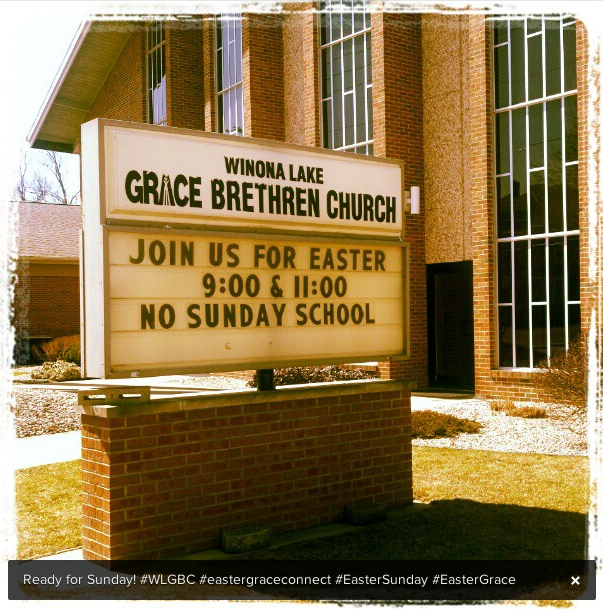 See what others have submitted at https://graceconnect.us/easter2013/ or simply click on the “View Photos” icon at graceconnect.us. If you don’t use Instagram, simply email your images to lcgates@bmhbooks.com and we’ll post the best to the gallery. So great to view the other pictures from Easter from the family of Grace. Thanks!